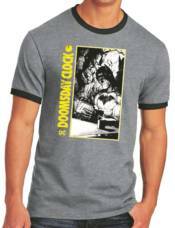 Unveiled at the 2017 NYCC, the popular Doomsday Clock Ringer Tee is here!! Features the art of Gary Frank screenprinted in black, white and yellow on a heavy heather grey and black ringer tee. Check out all the comic, the shirt and then check out our selection of previously-released goodies. NOW AVAILABLE for sale in Canada and U.K.